Running allows you to get away for a while, to reach goals that you never thought were possible, and to eat as much ice cream as you want afterwards! 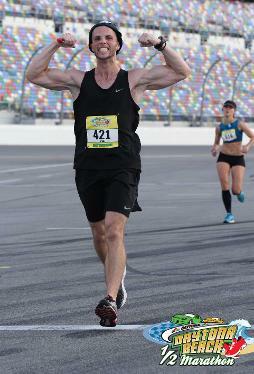 Finishing my first marathon with Keith Straw, running legend who has run over 300+ marathons! I have had the good fortune to pace some friends in past races, and when they ran their desired time, their energy and enthusiasm warmed my heart, and I want to help people pace for that race they thought they could never do. A fellow runner was working very hard, so much so that they could not squeak out a word or two at a time. And to keep them motivated and going I told them stories of all of the times I had been rejected from girls, failed exams, or had embarrassing things happen to me, and whenever I looked over they smiled. They ended out sticking with my pace and they had reached a new PR! I love to talk, be sarcastic, and meet new friends. Also love to shout out to spectators “Good Morning” and replying to their funny signs, and I like to keep things interested and lively, because 26 miles can get monotonous. I have ten riddles I use every day, so be prepared. I look forward to running with you and getting to know you! I regularly give blood and donate money to Hemophilia, Parkinson’s, and Cancer each month. Additionally my Dad and I have had an agreement to volunteer at a hospital each week, so we have kept with that for a couple of years.